As an attorney who’s invested countless hours of your time and energy to author a book, you’re in surprisingly rarified company. Most lawyers never achieve the dream of becoming published authors. Even those who do struggle to get their messages out there. It’s not easy to write a compelling book about the law, and it’s profoundly hard to educate and entertain in a way that’s also literary. Original contribution. Is the book meaningful and useful? Does it help the audience and/or introduce new insights to the field? Clean copy. The book should be meticulously edited and organized. It needs to flow clearly. The content should be factually and legally accurate. The book needs to be more than just a marketing piece or “self help.” It should have flourish and literary qualities. Third party credibility. We look for positive reviews from newspapers, authoritative legal publications and attorney peer groups. What Comes with the Award? Your picture on our magazine. 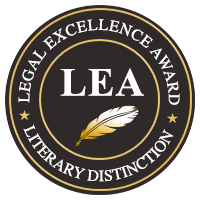 Winners of the Legal Excellence Award for Literature will get to have their pictures on The Attorney Magazine’s cover. 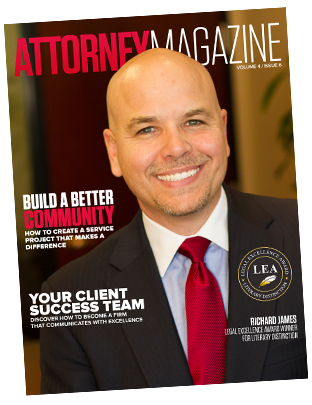 Our subscription reaches hundreds of your attorney peers and colleagues. Press release. A press release will announce and celebrate your award, teasing the big idea of your book. It will include quotes from the press as well as from independent reviewers. Your headshot and bio on our webpage. We’ll include a link back to your own webpage, so that people who read about your book can easily learn more about you and your legal services. LEA winners can order a special, bespoke trophy to display in your office! Logo for your website. Winners can advertise their achievement with this logo, which directs back to TheAttorneyMagazine.com.